I have to be honest, New Year’s Day is one of my favourite days of the year. I love that feeling of a new start and everyone wishing each other ‘All the best’. We tend to spend New Year’s Eve at home now, family time after an afternoon out – We sometimes eat out but more often than not beige savoury pastries make an appearance with a vat of G&T. We do have a ritual on New Year’s Day that we just love though and we like to feel refreshed for it. A huge gang of us have been meeting up early afternoon for the past 10 years, going on a 6 mile(ish) walk. We’ve done it in all weathers, bitter cold, howling wind and so much rain sometimes that we’ve had to strip off to our underwear at the front door as we get home. We invite anyone who wants to join in – People don’t always know each other at the start of the walk but they certainly do by the end. You find kids talking to adults, adults making sure other people’s kids cross the few roads we come across safely and plenty of snacks along the way. The people who come along vary between years, sometimes we are victims of excess celebrations the night before, but on the whole we tend to have around 30-35 of us. And, of course, there’s a pub stop. A lovely country pub, that often has a roaring fire. 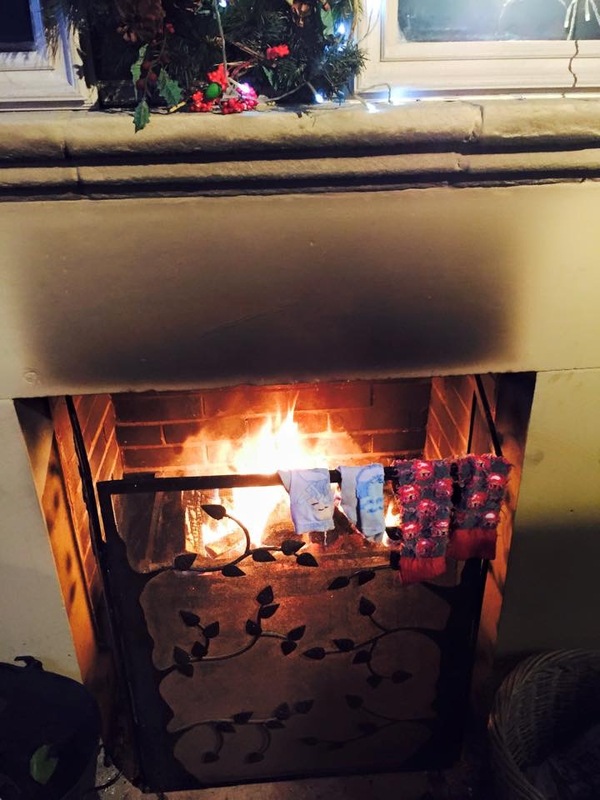 (Comes in very handy for drying soggy socks!) Some of us take it easy with a warming hot chocolate, some of us hardened New Year revellers carry on with a Guinness. We sometimes end the day with a huge party at one of our houses – a real informal affair where we empty our fridges of leftover food. Sometimes, we just end up at another pub! The perfect day! There are more bloggers that blow off the cobwebs and take a New Year’s Day walk, including Emma from The Cheshire Wife who braves New Brighton, Jenny from Monkey and Mouse and Simon from Man v’s Pink who walks off that hangover. Emma -Louise from Even Angels Fall starts off the day with a Bucks Fizz and walk to a special spot. Jennifer from My Mummy’s Pennies combines a visit to family with a brisk walk to make up for all those mince pies consumed. Spare a thought for Lauren from Belle du Brighton who had the early shift at work today with a 6am start. There’s a common theme that a lot of us bloggers enjoy a good feast on NYD! Jo from Miracle Max eats out while Joanne from 3 Kids No Sleep enjoy a feast at her parents. Some bloggers even treat New Year’s Day like a second Christmas Day like Charlotte from Cups of Charlotte who spends the day at her in-laws. Deborah from Country Heart and Home and Laura from Five Little Doves also carry on the Christmas celebrations. Hannah from Hans Plans has a get together at her parent’s church where every person takes part in a shared service. Lovely idea. Danielle from Someone’s Mum keeps it simple with movies and keeping cosy. Also keeping a low key day is Maria from Suburban Mum and Laura from Life with BabyKicks. Emma from Me and B Make Tea likes to spend the day concentrating on the positives for the year ahead. Kimberley from Media Mummy was hoping to engineer the day so her grandparents take over the early shift with the littlies – Hope it was a successful day! Another traditional outing was from Lizzie from Lizzie Somerset who likes to spend NYD at Haynes Motor Museum. Emma from Bubba Blue and Me has a brilliant day planned with a huge gathering of all their farming friends and a shared meal and party. Billed as her favourite day of the Christmas season! Have you heard of first footing? I have through my other friends in the NE. Nyomi from Nomi Palony keeps to the tradition after midnight. Perhaps you do it yourself? Congratulations to those celebrating birthdays on this day – Kelly from Kelly Allen Writer is celebrating herself as is Jessica’s daughter from Beauties and the Bibs. Not forgetting Dannii from Hungry Healthy Happy who is spending her first New Year’s Day as a mum this year. Whatever you have done today, I hope it has been surrounded by the people you wanted to be near and you feel refreshed at the start of the New Year! Happy New Year to you all! That sounds very productive! Good on you! Happy New Year. Its lovely to blow away the cobwebs with a brisk walk isn’t it? Happy New Year to you! Thanks for including us! It’s great to see what others do too! Your walk sounds so much fun! Its a great start to the year – Always plenty to chat and laugh about! This sounds like a lovely tradition! I spent my NYD on the sofa, hungover, eating pizza and watching TV. I rarely get the chance to have ‘nothing’ days, so I embraced it! That sounds just a perfect day too – Sometimes we need a lazy day to recharge our batteries for the year ahead! 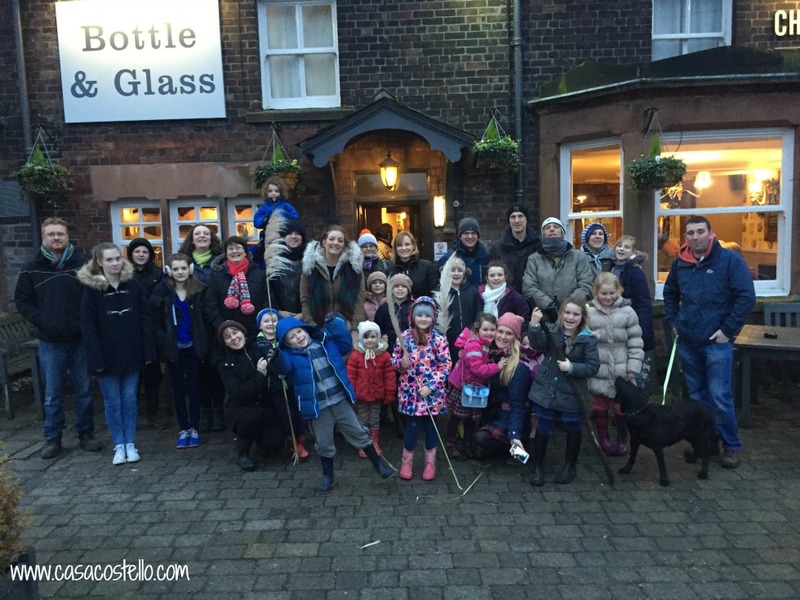 I’ve loved finding out what everyone else does – Our walk is great for nosing through people’s windows seeing families having get togethers too! That sounds such a lovely idea, everyone mixing with one another, adults and children (and the pub stops sound much needed too). Yep we all muck in together – the pub could quickly be becoming one of our favourite parts of the day! Love your new years day tradition. We actually never go out new years eve, I never have and jimmy does not, instead we like to go out on New Years day to pubs when it’s quieter and more enjoyable to ring in the new year. I always felt like it’s the non drinkers that ruin new years eve with bad drunken behavior. so many fights and accidents. New Years day is my favorite of clearing out the old and getting getting ready for spring, I basically do my spring cleaning over the new year holiday so that I can relax in the start of the new year and focus on new goals. That sounds a great way to spend New Year – I certainly don’t miss the hassle of being out on NYE. What an amazing tradition, I started the New Year with my parents we went to church and then chilled before I left to go back to mine. This has been our tradition for years now. That sounds like a lovely family tradition too.I bet your parents really enjoy your company too. I never really knew that people do special things on New Year’s Day. Will have to look into this! The more people I talk to, the more I find out that people treat it as a special day too! I’m so glad we have our tradition. To be fair, we didn’t exactly have a wild night the previous night – Love blowing away the cobwebs. Impressed with your productivity though! Cosy and warm is exactly what is called for sometimes – It was a freezing day so we had to get well wrapped up! I’m really liking the ways you spend New Years Day with loved ones. Mine was pretty boring! It’s interesting to see how other people spent theirs! Our walk seems to be getting bigger all the time – people have even started saying they will come on next year’s. Spending time with family is a lovely way to spend the day – perfect start to the day. This is such a great tradition! I’ve always been a bit too hungover on NYD to do anything like this but life is changing so it’d be lovely to start. Great to read about what everyone else gets up to as well! That’s a great tradition. I must admit I do envy you. There were only a few of us on New Years day and all the other want to do is eat and watch tv and it’s normally dark by the time that’s over so I can’t go walking on my own. We started off with only a small number but it has definitely grown over the past 10 years. Ha! I love that your year starts a day later than everyone else – Hope you had a good rest. Being together is just as important – Hope you all had a lovely day playing games. These walks you go on sound like a lovely way to bond with a lot of people! Parties should never stop! I might adopt the Bucks Fizz idea for next year too! What a great start to the new year and a fab way to meet others. It is lovely seeing people get to know each other and oldies and youngies get along. Its nice to see how everyone celebrates new year, Its great to meet other people. And a Happy New Year to you too -Hope you had a lovely time. How lovely! I went for my standard morning run, and like most people hit B&Q for home improvements of the new year! 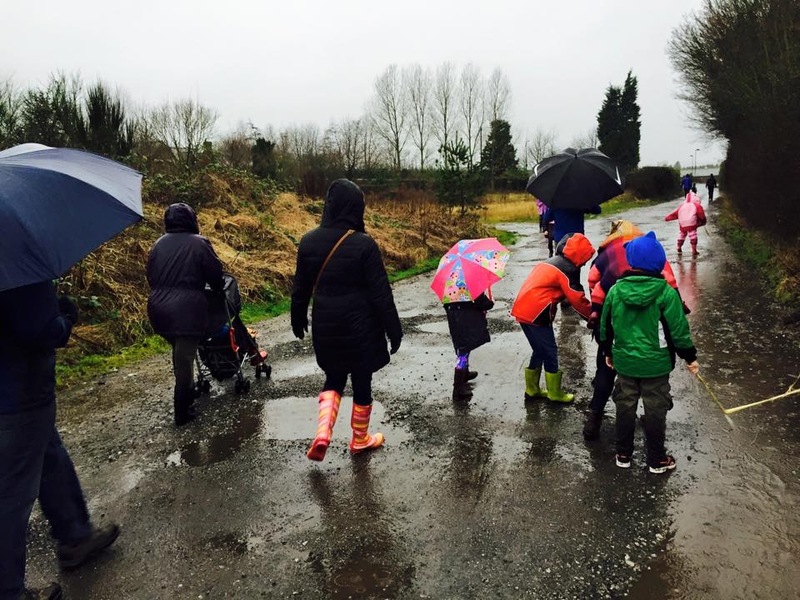 My folks went on a very soggy walk on New Years Day too! They even enjoyed Guinness, hair of the dog is the best! The best way to spend NYD! Hair of the dog is the only way to recover! This looks like so much fun! Happy new year. Sounds like everyone had an amazing new years day! We spent the day lounging in our jammies and watching chick flicks!